Pandora plays in a Nissan vehicle center stack. Pandora dominates the Internet radio segment, according to an Arbitron survey. Here's the share of smartphone owners who downloaded each app. Automakers are rushing to add Internet radio apps such as Pandora, iHeartRadio, Spotify and Aha to their infotainment systems. Although Internet radio lags its more established rivals, it has gained a foothold among motorists, according to a February survey by Arbitron Inc. and Edison Research. Twelve percent of respondents said they have listened to Internet radio in their vehicles. That compares with 15 percent for satellite radio, 63 percent for CDs and 84 percent for AM/FM radio. But automakers appear eager to add Internet radio, and the nation's radio stations are fueling the trend by streaming content on the Web. "This is one of the hottest topics in the radio business," said Ed Cohen, Arbitron's vice president of measurement innovation. "It's like the Wild West. It's way too early to declare a winner." Pandora has a clear lead in the Internet radio race. According to the Arbitron/Edison Research survey, 47 percent of smartphone owners have downloaded the Pandora app. Fifteen percent downloaded iHeart- Radio; 6 percent got Spotify; and 5 percent obtained Aha. Smartphones receive Pandora's signal from the Internet and channel it to the vehicle's infotainment system. 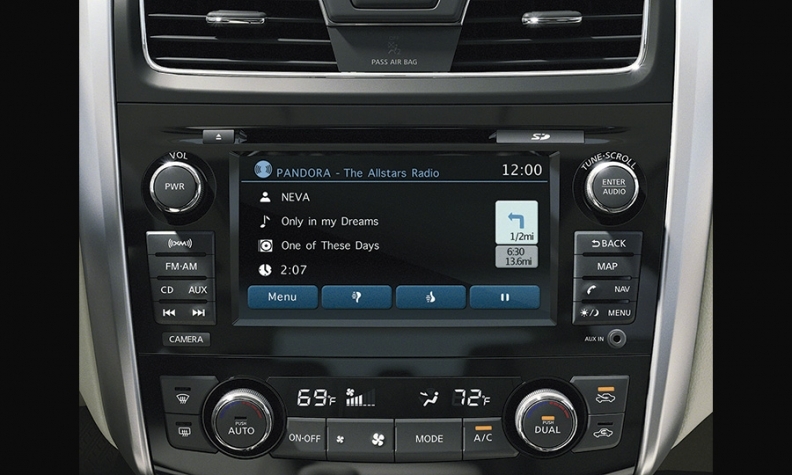 In addition, some automakers include Pandora's app in their infotainment systems, so motorists can use the cockpit controls to select Pandora stations. Twenty-three car brands have integrated Pandora into their infotainment systems, and Pandora boasts that through June, it had 71.1 million active listeners on all devices. Pandora offers a choice of free service with commercials or a commercial-free service for $3.99 a month. The company built its listening audience, which attracted automakers eager to accommodate those listeners. Harman International's Aha Mobile Inc., which offers 30,000 stations featuring music, talk shows, news and comedy, has taken a different approach. "We're a little bit like cable TV," says Rod MacKenzie, vice president of automotive business development. "We are not the branded content; we are trying to be the pipe that brings it into the car." He says his company acts as an umbrella for a variety of infotainment apps, then updates them as needed. This frees automakers from having to handle software updates, and motorists from having to visit dealerships to get those updates. MacKenzie says Aha also can help automakers analyze vehicle and customer data to determine what motorists listen to and when. Automakers could use that information to design apps and services that would appeal to motorists, says analyst Roger Lanctot of Strategy Analytics. Aha and TuneIn are the Internet radio providers best positioned to help automakers do this, Lanctot says. "If the customer agrees to share his information, they would have the ability to turn the car into a moving customer clinic," he says. Aha, which Harman acquired in 2010, has signed up Acura, Chrysler, Ford, Honda, Porsche, Scion and Subaru. But Aha's MacKenzie realizes the challenge ahead. "The 800-pound gorilla is still AM/FM radio," he says. "I think we are going to see a transition. But how long it takes, I wouldn't care to judge."